Log dogs or log grabs. This is from the 1937 Warren Axe & Tool Co. catalog. I've been around sawmills since 1970 all over British Columbia and Alberta and I can say I have never seen anything like exactly like that.They do resemble log dogs as I know them but the ones your showing have an extra point at the left end of the top bar. 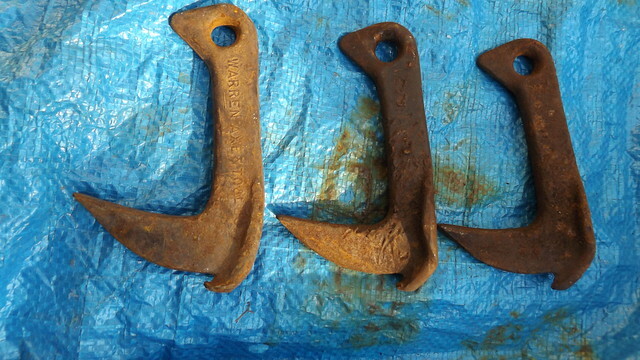 I can see those being used on a log carriage for a head rig to hold the logs in place while the cut is made but I have no idea what the extra point is for. The dogs I,m familiar with would have either another eye at the top to attach a air or hydraulic cylinder to or if they were for a basic bush mill the they would be heavier and thicker on the top bar so you could manually pound them down into the logs with a hammer. A standard 20 foot carriage would have 3 or 4 of these dogs spread out equally to hold the log during the cut. They don't show any signs of hammer blows on the top so I almost think they have another purpose but what that may be I have no idea. I typed my first reply before seeing the post from mrbill but I still don't see where they would be used. I'll do a little more digging and see if I can find there actual use. this is not the first ones of this style I have had, all from the northeast, maybe its a regional difference? 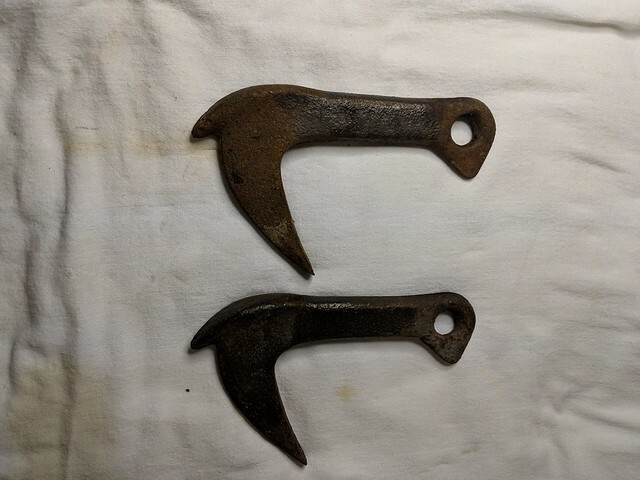 I did a little more looking and it seem they were used in pairs for skidding logs out of the bush, mainly by horse loggers long before the days of grapple or line skidders.